Our network was built from the outset for customers who rely on it for critical business processes. Wherever you are in New Zealand we can connect your business premises across New Zealand or Australia, provide reliable, fast, secure connections to data centres, or provide high speed Internet so your business can take maximum advantage of cloud-based services. We do this by owning and managing a nationwide data network that includes MEF certified fibre networks in Auckland and Wellington. MEF certification means your business can connect with confidence to one of the most reliable networks in New Zealand. Our target availability is 99.9% (excluding scheduled and notified maintenance) – which works out to less than nine hours downtime in an average year. 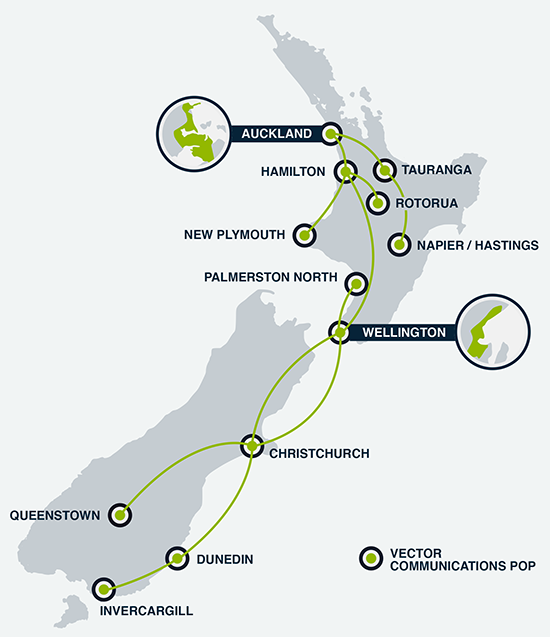 We connect New Zealand businesses via our own high capacity data network with points of presence (POP) in Auckland, Wellington, Christchurch, Hamilton, New Plymouth, Napier/Hastings, Tauranga, Rotorua, Palmerston North, Queenstown, Dunedin and Invercargill. We can connect locations outside these areas using our Partner networks.